With Peter Morgan’s The Audience opening next month, Samuel Hodges, director of Nuffield Southampton Theatres today announces the company will be commissioning a new play about local pub, The Hobbit and its legal battle with a Hollywood film company over copyright infringement which began in 2012. 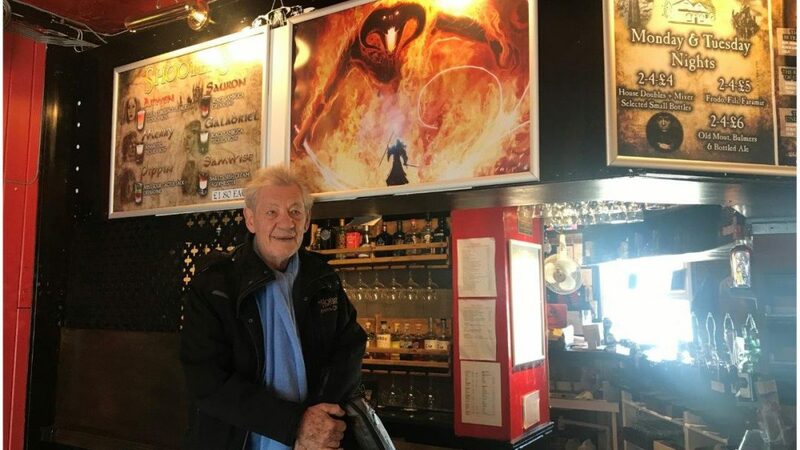 Sir Ian McKellen, who alongside Stephen Fry spoke out in support of the pub in 2012, marked the announcement with a surprise visit to the establishment on Wednesday 10 April while he was visiting Southampton on his UK tour, Ian McKellen on Stage. The company’s Autumn Season includes New Wolsey Theatre’s One Man Two Guvnors produced in association with Nuffield Southampton Theatres, which following a run at New Wolsey Theatre in September, opens at the NST Campus on 1 October and runs until 12 October. The Royal Lyceum Theatre Edinburgh in co-production with Birmingham Repertory Theatre, Bristol Old Vic, Northern Stage, Nuffield Southampton Theatres and Oxford Playhouse present Tron Theatre Company and Blood of the Young’s Pride and Prejudice* (*Sort Of). The production tours the UK from September 2019 and opens at NST City on 16 March until 28 March 2020.